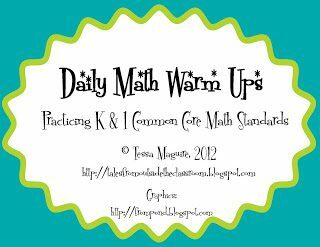 I spent my evening getting my math warm up packet blog ready. Meanwhile, I had an eye and ear on college basketball on the t.v. Lehigh just beat Duke. Duke. Duke, who beat my beloved Butler Bulldogs two years ago. Duke, who has never lost in the first round of the tournament. (I’m sure that fact is not correct) Duke. I’m all kinds of excited. A teeny tiny team beat the big guy. The big guy that happens to be Duke. They stomped on their toes and stuck their tongue out beat them. Go Lehigh! This math warm up pack was created for my kindergarteners. They do both the K and 1 standards each year. We’re full day and have a long day and it just works for us. So, this packet is a review of standards from both grades. I realize that may not work for everyone, but it’s what works for us and I thought I’d share it anyway. I also did something a bit different with it. I created a free sample with 4 of the pages as a separate item. I think more people could find it this way, and it may make it easier for you to try it out and see if you like it. Let me know what you think about having the items set up this way. Feel free to comment on this post, and thanks! You can download the free sample pack that includes the files shown above plus one more in my TpT and TN stores as well. Click here to get it your freebie file! The 40 page pack is available for $5 in my TpT and TN stores. I’m one tired cookie. I wanted to get this posted tonight so I stayed awake, but I think it’s time to hit the hay. I’m so glad it’s the weekend and I get to sleep in tomorrow! Thank you! I wanted some way to make them cute but I didn't want to do a fun font since it's for little ones so I chose clip art. I still hoped it was a bit cuter but I know that we are our own worst critic! Thank! I'll be making some for other grades shortly. I'm so glad to hear that. I teach 2nd grade and would love a set aligned to the Core for that level. These are awesome!! Thank you for sharing and for linking up!! Thank you! They truly came out of need. I'm glad others are finding them useful as well. I just stumbled upon your awesome blog! I am heading to your TPT store to get your math warm ups. Stop by my blog sometime. It is fairly new. Thanks! Your blog is cute. I'm fairly new to blogging to so I love to see what everyone else is doing on their blogs. I usually just do K-3 items since that's what I focus on. I may but am not certain. I, too, would love to see fourth grade. If not, it will be a great guideline for me to follow. I will work on fourth grade after I finish third. Thanks for stopping by! I appreciate your hard work. I understand using these for first grade, but not in Kindergarten. We know what young children need and what is appropriate for them. Our young children have so much curriculum pushed down on them and are expected to do things that are not in their best interest. There has to be a better way for them to show what they know. Thanks. Marshall, I understand your opinion. If you are not interested in them, don't download or purchase them. With that said, they actually were created for our kindergarten students. Those students have gone through all of the K and 1 CCSS in math. We are a full day program. It was created out of necessity for them, and it is exactly what they need for that 10 minutes of the day. I understand that many schools across the country have students walking in who don't know any letters, colors, etc. and they haven't had the background they need to allow them to take math this far. I have worked in those schools. However, the school I am in now has students come in who know letters and numbers and we spend our days applying them. This may not be appropriate for you and your students, but it is appropriate for mine. Everything looks good…not to sound greedy, when should I expect 4th grade? I'm not sure when or if I'll get to 4th grade. I am not as familiar with that grade and I've had some additional requests for grades I'm more familiar with. It's on my plan but there's a lot of things on my plan too. I wanted to know – do you use 1 page a day? Do you give each child their own copy? Do you put it in a center? I was curious how you use the pages. I currently teach 3rd grade. I've heard of teachers using it as a center, projected and done as a whole group, and as homework or morning work. It really can be used any way that you'd like. Typically, yes, the kids do one page a day.